Grand Prefect Lorem waited anxiously at her window. She had been doing so for what seemed to be days now, waiting on word from the other two members of the triumvirate. The three branches of the College of Silence rarely make decisions together, but this was an unprecedented situation. For months now the otherworldly horrors of the Kerberos had been invading the lands of Elgea and the Broken Lands, and for months the scholars of the College had been ceaselessly studying the invaders and the strange essences they leave behind upon death. The College finally had a breakthrough: The sinister spheres that some demons carry inside them, nicknamed “Hearts of Darkness”, bear within them latent dark magic which can be transferred to mundane objects (and sometimes living creatures). The scholars then extrapolated on this new development and found that, under the right conditions, the very vitae of living creatures could be extracted and concentrated to form crystals with consistency much like that of the Heart of Darkness. 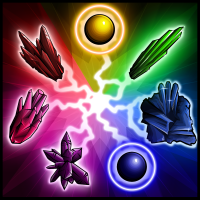 Similar to the Hearts, the essences within the crystals can then be infused into weapons and armour, creating fantastical new armaments with augmenting properties. The release of this new knowledge was put up for a vote by the Triumvirate of the College of Silence, and only one vote remained; that of Grand Prefect Jezine who commands the Hall of Reflection in Coanhara. Keeping true to their name, scholars from the Hall of Reflection always seemed to take an inordinate amount of time to make decisions while they deliberate on all possible outcomes. “What good would come of suppressing this knowledge?” Grand Prefect Lorem pondered in frustration, “Thousands are dying every day by the nefarious claws of the Kerberos.” Before her ire could be stoked any further by the indecision of the Hall of Reflection, a hurried knock from her chamber door snuffed out her smoldering contemplation. We're proud to release the next part of our multi-stage release with the introduction of the Enchanting School of Magic, featuring 18 new researchable spells. These spells aid players in crafting Illyriad's most powerful equipment yet. I guess those of us with only the vanilla dogs, wolves, rats, brown bears, scuttlers, scritchers and the occasional spider spawns don't get to participate. I have some of the research done and am a bit stomped. I've done Lesser Mana Fusion. I assume it is what's required to do a lesser mana crystal. I have the mana required and the mineral. Where do I create this thing?